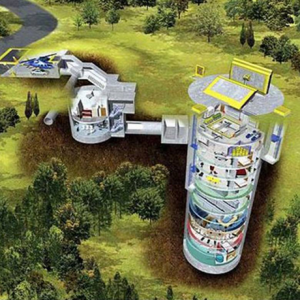 For those who want to survive the apocalypse and have a couple of million dollars to spare, the Survival Project is a luxury condo complex built in a former underground missile silo in Kansas by the Army Corps of Engineers in the 1960s. 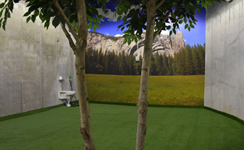 Accommodations start at $1,500,000 for a 900 square foot luxury bunker. 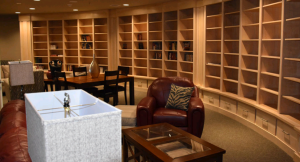 A larger 1,820 square foot luxury bunker is also available. The complex is designed to support 75 people for up to five years. Built to survive a nuclear strike. Entry is through blast resistant doors. Able to withstand wind of more than 800 kilometers per hour thanks to an outer structure and nine feet thick outer walls. 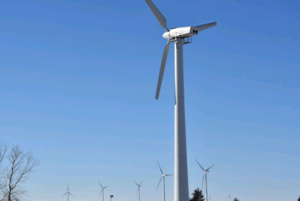 Utilities include electricity supplied through the electrical grid, wind turbines and generator plus a water supply source. 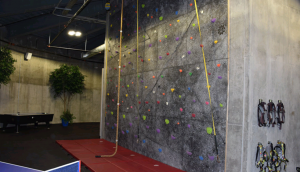 rock climbing wall, exercise room and theatre. 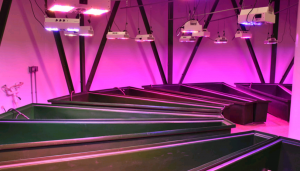 Hydroponics garden provides fresh produce. 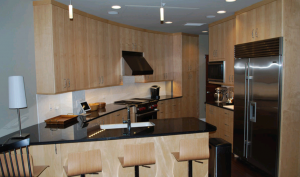 Suites include a five year supply of freeze-dried and dehydrated food. Suites come with furnishings and automation system that includes security cameras, intercom system, satellite TV access, weather station access and internet. Other amenities include five years’ worth of toilet paper, sick bay with doctor in residence, jail cell, armoury and sniper post. Should a catastrophe occur, a SWAT-team-style truck will pick up any owner within 400 miles.